Don't miss out: #AMEBoston last-chance discount ends soon! Looking to further your lean and continuous improvement journey and save money? Register for the 2017 AME International Conference in Boston by June 30. Depending on the number of registrations, you can save anywhere from $100 to $300 per person by registering before the deadline. This year, our conference theme is “Get Engaged” and is designed to help organizations create a culture of engagement, where employees feel more empowered to act for the good of the team. This leads to improved efficiency and an increase in productivity and overall business performance. The conference is highlighted by nine keynote speakers including lean experts John Shook and Paul Akers, Harvard University Professor of Psychology Daniel Gilbert, world-renowned mentalist Max Major, leadership expert David Marquet, Toyota Motor Manufacturing of Kentucky President and CEO Wil James and Boston Philharmonic Orchestra Conductor Benjamin Zander. Witness lean and employee engagement in person at plant tours in the Boston area. Some of the organizations opening their doors include Bausch + Lomb, Cirtronics, New Balance, Pratt & Whitney and Thermo Fisher Scientific. Keep checking the Tours page for more additions. You’ll have opportunities for fun and collaboration with friends and colleagues at various networking events throughout the conference. New this year is SpeedNetworking, where you can increase the quantity and quality of your connections. Registration is now open for this event, which takes place on Sunday evening, October 8. We believe this event will become a new conference favorite. If you’re new to an AME conference, join us for Club NuBee on Sunday and Monday evenings, October 8 and 9, where you’ll get an informative and entertaining overview of our conference. Prizes will be raffled off, and the bee costume is optional. Break bread and connect with fellow attendees at the Dine Around, which takes place on Sunday and Monday evenings, October 8 and 9. It’s a great way to relax and discuss your favorite topics at some of Boston’s finest restaurants. If you’re feeling competitive or adventurous, don’t miss the AME-zing Race on Monday evening, October 9. Contestants race to complete assignments throughout downtown Boston and utilize teamwork and collaboration while exploring America’s most historic city. Other networking activities include a Selfie Networking Contest, Happy Hour in the Learning Resource Center and the San Diego night reception. If you’re coming to #AMEBoston with a partner, check out the Companion program, which is a great way to explore Boston in a group setting. Registration is now open for Companion activities. 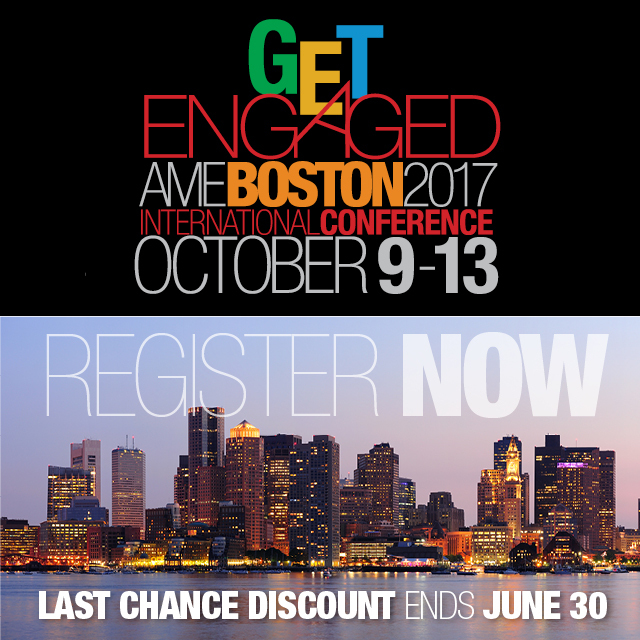 Get engaged with us this fall at the 2017 AME International Conference in Boston, which takes place from October 9 – 13. It’s an opportunity to share, learn and grow with new friends and colleagues. Register before June 30 to take advantage of the last-chance discount. Visit the #AMEBoston website for more information or to register.